Harmonious Breathing is a simple and eﬀective method that teaches us how to rediscover ﬂuid, complete respiration and integrate it in our lives. As research consistently shows, breathing well is vitally important to all of us. It is the key to a positive, relaxed state of mind, sound sleep, good digestion, stabilized blood pressure, and countless other health beneﬁts. 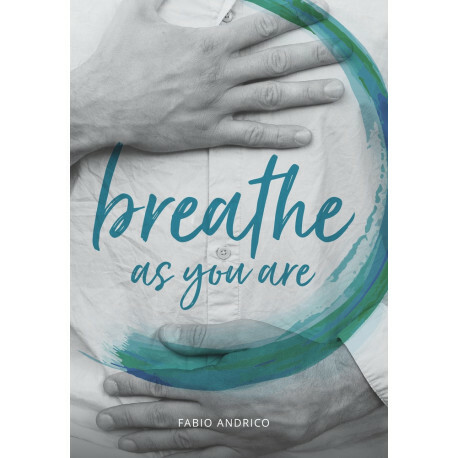 Breathe As You Are is a comprehensive, full-color guide to Harmonious Breathing, with easy-to-follow exercises for anyone. Developed by seasoned yoga teacher and breath expert Fabio Andrico, Harmonious Breathing is taught internationally and online at www.harmoniousbreathing.com. This book is particularly helpful, for those who like to apply something simple to work with their breathing, as well as for yoga practitioners or teachers. The aspect of breathing is assuming more and more relevance in our lives. Kind of neglected in the past, we are now realizing that breathing is the base of our very life, not for merely surviving, but for having a good quality of life. The concept of ‘awareness’, or ‘mindfulness’ which is increasingly spreading in general, can apply to breathing, and this book teaches how to approach it, to experience in practice the functioning of our breathing system, develop certain patterns and learn to relax into them. The section devoted to the exercises is of course very useful, because we can find there something practical to apply, but the parts regarding the functions of our respiratory system and some of the recent studies and research on the effects of deep, complete breathing are extremely interesting. In fact they make the reader understand why it can be so important to breath well, in order to prevent some of the most common ‘modern’ diseases and overall to leave more happily and freely. This book condenses the long-term experience of the author, and reflects his genuine knowledge of human body, and especially of the breathing. A perfect guide to re-discover and develop natural breathing. Theory and practice are explained in a simple and precise way and all series of exercises, from easy to challanging, have helpful pictures. Useful and easy to apply for anyone, don't miss it! Awesome! I bought this book some months ago. I love it! It is well structured, the explanation is easy, the drawings and photos are nice and give a precise idea how to train various phases of breathing (abdominal, intercostal, thoracic, clavicular, dorsal) with or without cushions, yoga props etc! Beautifully designed and printed, the exercises in this book are very useful for learning and teaching to develop our complete and harmonius breathing capacity. As an instructor, I find the explanations in the book extremely clear and adapted to the capacity of every student.